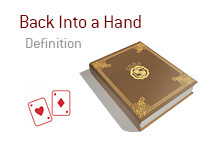 What does the term "back into a hand" mean as it applies to the world of poker? What is the definition of the term "back into a hand"? If a player "backs into a hand", this means that they end up making a hand that is different than the one that they were originally trying to make. For instance, let's say that you are holding Ah-Kc. Action folds around to you on the button. You put in a raise, and both the SB and BB call. With this hand, you are obviously look to make a pair of Kings or pair of Aces. The flop comes Ac-2s-4c. This is a great flop for you, as you have flop a pair of Aces, top kicker. Both players check to you. You put in a bet, and both players call. The turn brings the 6c. Check. Check. Bet. Call. Call. The river brings the Qc. Now, instead of your pair of Aces, suddenly you have the stone cold nuts - the Ace High flush. You have "backed into" your hand here, as you certainly weren't expecting to hit a flush, but that is exactly what you have in your hand after the river. One of your opponents ended up holding the Jack of Clubs in their hand, which allowed you to get paid off one more time on the river.